Having been producing ammunition for almost as long as the well-known Federal Cartridge brand, the Prvi Partizan lineup has been getting more popular in the United States, but they are no newcomer. 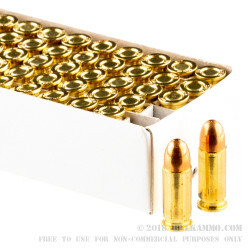 That is important when you are buying ammunition – because a cheap price and a decent looking round aren’t everything. History and reputation are important. You want to know that when you pull the trigger it’s going to ignite and hit the target. Prvi Partizan has the reputation in Europe and in most of the world and is now gaining a great foothold in the United States shooting market. 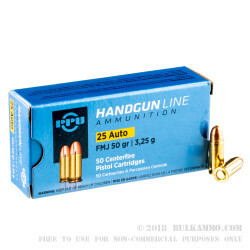 The Serbian producer of ammunition likes to focus on military and law enforcement calibers that are now in the mainstream market for the most part. They are particularly good at offering some of the “obsolete” cartridges that don’t get massive production volumes anymore. It’s truly impressive to see some of their offerings at the price they are able to sell them for. 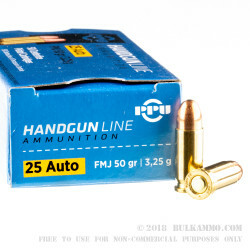 This .25 ACP is one of those offerings. This is an impressive price point for a round that doesn’t benefit heavily from volume pricing metrics. 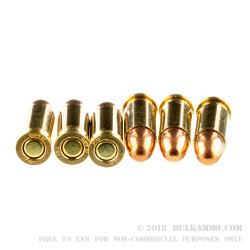 This is a 50 grain centerfire round that offers a Boxer primer, a brass case and a full metal jacket projectile. First time using prvi partisan ammo. I was surprised.